The chart is from the St. Louis Fed’s Fred database which I’ve highlighted and you can find the original here. 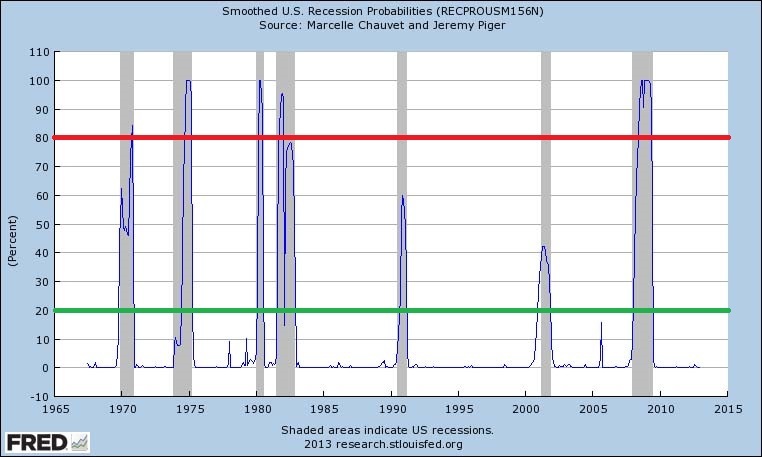 According to U of O Professor Jeremy Piger: “Historically, three consecutive months of smoothed probabilities above 80% has been a reliable signal of the start of a new recession, while three consecutive months of smoothed probabilities below 20% has been a reliable signal of the start of a new expansion.” For a more detailed explanation he wrote with Cal Riverside Professor Marcelle Chauvet go here. (Spoiler alert) The parametric Markov-switching dynamic-factor model works better but you can find the chart without having to do all the math yourself. If the Fred link above goes dead you can search on it by it’s code name: RECPROUSM156N. As apartment building investors and not econ professors (or Wall St. rocket scientists, it would take much more time than is worth it to build our own parametric Markov-switching dynamic-factor model) just by looking at the chart it is clear that waiting for 80% means your already in a recession*. Calling one at that point may get you tenure but for our purposes whenever it spikes up to 10% looks like time to batten down the hatches. Bill’s Calculated Risk blog is a must read for investors tracking the economy, housing and the apartment building investment cycle. *Of course a real time recession call is better than the usual NBER after the fact call or ECRI’s hypersensitive cycle which tends to make more downturn calls. For more on Calculated Risk v. ECRI see here. I still check ECRI’s Weekly Leading Index and their Future Inflation Gauge every week though. Next Next post: Latest Commercial RE and Apartment Building Investment Cycle Charts Posted by Glenn Mueller PhD.